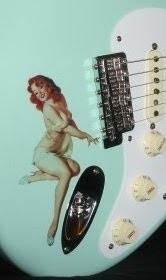 This Friday's Strat, aptly named "Sticker Strat" , is owned by none other than Steve Vai. 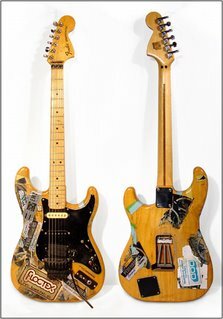 Originally purchased by his mother when Steve was 15, Sticker Strat has been used throughout Steve's career and continues to be utilized today in various recording situations. Without going into its specs, let's just say it's a Fender Stratocaster that's probably been the platform of numerous mods and experiments; a patriarch of Steve's Ibanez JEM guitars. Beyond symbolizing a brilliant career, this guitar also represents a parent caring enough to buy a real and playable instrument. The cheap "discount store" guitars some parents may settle for, sometimes do more harm than good. The Vai family recognized their son's potential and made sacrifices for Steve's musical development. Steve Vai's father even cashed out the family life insurance policy to send Steve to Berklee College of Music. For the Vai’s, the risk turned into great reward. Still, many families lack sufficient income and the wherewithal required to provide adequate music education, instruments and other resources for their talented kids. Budget cuts force many public schools to cut back on music curriculum. Recognizing these problems, Steve Vai helped found and create the Make A Noise Foundation (MANF), a non profit organization providing support to various music related scholarships which assist young musicians of lower income circumstances. Click the links in this article for details on what MANF sponsors, who is being helped right now and how you can contribute. The next Steve Vai, Chick Corea or Jaco Pastorius could be skateboarding up and down your street. Steve created a way that he could give back, and with our help as well, ensure music education opportunities for those who otherwise might not afford it. Let's make the Sticker Strat a symbol of support to future generations of musicians.